Saturday, February 25, 9 a.m. – 4 p.m.
Watermark Art Center & Willow Wood Market are excited to present the 4th annual Creative Spirit Fiber Festival, held February 24-25, 2017. $10 Saturday admission gives you access to a diverse vendor market filled with Fiber Art materials to feed your creative spirit, classes by experienced instructors, hands-on demos, door prizes and more! Featured this year: National instructor Kari Carr of New Leaf Stitches will present a class and trunk show. Learn more about Kari and her patented notions, Clearly Perfect Angles, at her website. NEW for 2017: Extra Day! We’ve added Friday evening classes to our lineup to give attendees even more to experience throughout the weekend! We are offering three diverse classes for you to choose from. Pre-registration is required. Each class is $10.00, but Saturday’s admission is free with your paid class fee. All three classes are from 5:30pm – 9pm. QUILTING – Park Avenue. Beginner level. Kari Carr will teach from her book, Just Around the Corner. 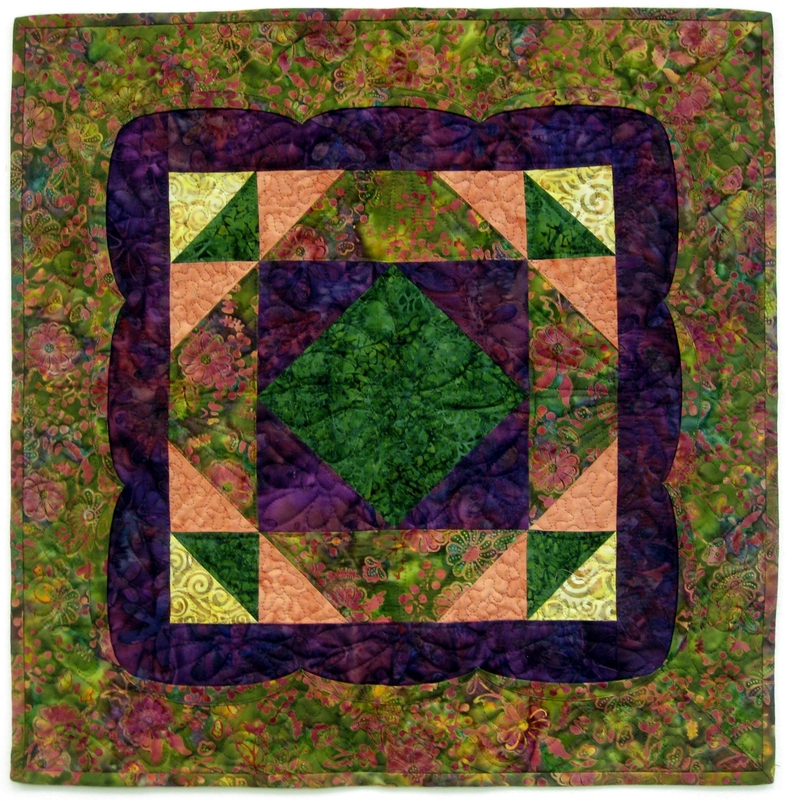 Students will learn how to use Kari’s “Clearly Perfect Angles” tool and the technique for mitered scalloped borders while making this beautiful 21″ x 21″ wall hanging. Book and tool (required)- $25.00. Optional batik fabric kit – $30.00 (You may use your own fabrics.) Supply list will be given when you register. NO PRE CUTTING! Must bring sewing machines and basic sewing supplies. Class limit 22. KNITTING – Introduction to Brioche Knitting. Intermediate to Advanced. Liz Towers will teach you to Brioche first with one color, then two, using Nancy Marchant’s symbols. Students will receive practice samples to work on plus handouts. No supplies required. Class limit 20. BASKETRY – Market Basket. Beginner level. Make this 8″ x 12″ handled basket with Eve Sumsky that will be perfect for shopping at the Festival on Saturday! Materials fee – $20.00 Additional supply list will be given when you register. Class limit 10.